What Is Romney’s Campaign Thinking? Don’t these people vet anything? I am now fully aware this picture is not real. Please see my apology and explanation here. I wasn’t quite sure I wanted to blog about politics, but it seems I just can’t keep my mind off the election. It’s easy to say, as I probably have many times before, this is the most important election of my life. I’m not sure it’s true. There is nothing, in my opinion, Romney and Ryan can do that will stop the inevitable. The arc of history has always bent toward the increasing prevalence of peace, justice, and freedom – even if it doesn’t seem that way in various parts of the world. Much like the existence of cooler temperatures in one small area of the planet does not prove global warming isn’t occurring, you can’t generalize from regional strife and even setbacks like our current economic conditions that our society is devolving. I have said more than once I almost thought it would be good for Michelle Bachmann to become our President because it would surely bring about the next – quite likely necessary – American revolution. I say “almost” because I really would prefer we evolve peacefully. Violence doesn’t generally do much for the species, although it may temporarily benefit one group over another. Now . . . having said that, let me offer that this probably is the most important election of my life :). We have just barely come through the worst economic collapse in several generations and we’re not out of the woods yet. In my opinion the Policies espoused by the Romney-Ryan ticket are destined to turn the United States of America into what Arianna Huffington has referred to as Third World America. As Bill Clinton said the other night, in his speech to the Democratic National Convention, the Republican position is “we left him a total mess, he hasn’t cleaned it up fast enough, so fire him and put us back in.” I’m pretty sure that’s not a good idea. I will have more to say about this in the next couple of months. There’s plenty of material out there. I just need to move it from Facebook to here. At any rate, this graphic is both sad and hilarious. I keep saying that the Republican Party leadership projects all of their worst traits onto others. To me, this is a perfect example of it. One can reasonably assume, if it actually crossed their mind it was important, they would have been willing to spend a little more money getting their buttons made here in the USA. That they don’t care seems pretty evident. Where the projecting comes in is I’m reasonably certain they think we don’t care either and won’t be paying any attention? Am I crazy? What’s your interpretation of why this would happen? PS – If it’s unclear in the picture I snatched from my Facebook news feed, the arrow is pointing to the words, “Made in China” . . . but you knew that, right? This entry was posted on Friday, September 7th, 2012 at 10:52 am	and tagged with American, button, campaign, elections, Made in China, POTUS, President, projection, psychology, Romney and posted in Politics, Systems Thinking. You can follow any responses to this entry through the RSS 2.0 feed. When does the blogger apologize for the lie in the article itself. The left perpetuated this hoax….which is a lie….but doesn’t hold anyone back from throwing it out there so the minions gobble it up. Sad. What’s truly sad is that Romney’s own life and career make (as well as the Republican Party’s cavalier attitude toward outsourcing, profit, and its effects on American labor and the economy) it so easy to believe his campaign would do this. 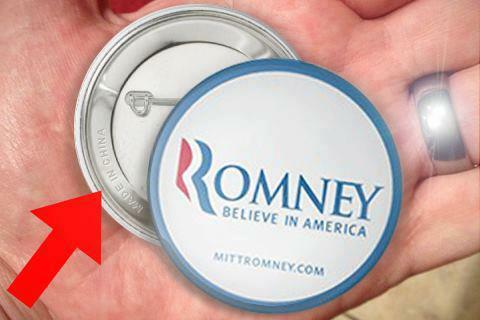 Nevertheless, I have apologized for my role in perpetuating an inauthentic, photo-shopped picture of a Romney-Ryan campaign button, as well as explained why I both wished it to be true and found it so believable. See today’s post. What do you think of Jeff Emmelt of GE? He’s our jobs czar…what do you think GE is doing in regards to outsourcing? Where is this jobs czar creating jobs? Don’t like it at all. However, he’s not running for President. As I just said to a friend: I’m afraid we’re going to hell in a hand-basket no matter who wins, the difference being there’ll be more creature comforts in the basket if Obama wins. In my estimation, it will make a huge difference. Examine the back of the button at the link below and compare it to your picture – Exact same markings and dark spots, except for the ‘Made in China’. Definitely photoshopped. Plus, zazzle also has President Obama buttons. Thank you. The link you’ve provided is useful, but doesn’t prove the buttons in question weren’t produced earlier. The site says everything was made in the USA, but the pictures aren’t the same. Another person sent me a link to Zazzle – http://bit.ly/O05KBm – where the button pics look exactly like the one I used and wrote about, with the exception there is no “Made in China” stamp on it. Assuming the words were photoshopped onto this picture it’s a very good job. However, it does look like the buttons were somewhat clumsily dropped on top of the hand. I will do a little more research and post either a retraction or an explanation, along with some analysis on why I found this so easy to believe, including an admission that part of me wanted to believe it. The photo is a hoot and made my day. Thanks for blogging politics. Thanks. Unfortunately, I’m now pretty certain it isn’t real. I’ll be writing a clarification soon.